Congratulations Michelle...The rest of us keep hoping! Enjoy. Such a great surprise for my day. Thanks so much! I just bet it made your day Michelle! yeah!!! do your happy dance! Congrats Michelle, The winners are getting closer to my state. Do Men ever Win? I would like to win one. 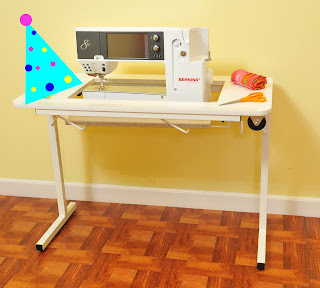 I have a cheap table that bounces when I sew my quilts.